Close Combat in 3D Released, 10 years ago. In 2003 Matrix Games along with Eric Young released Eric Young's Squad Assault: Westfront. This was quite literally Close Combat in 3D. Eric Young was one of the original developers with Atomic. 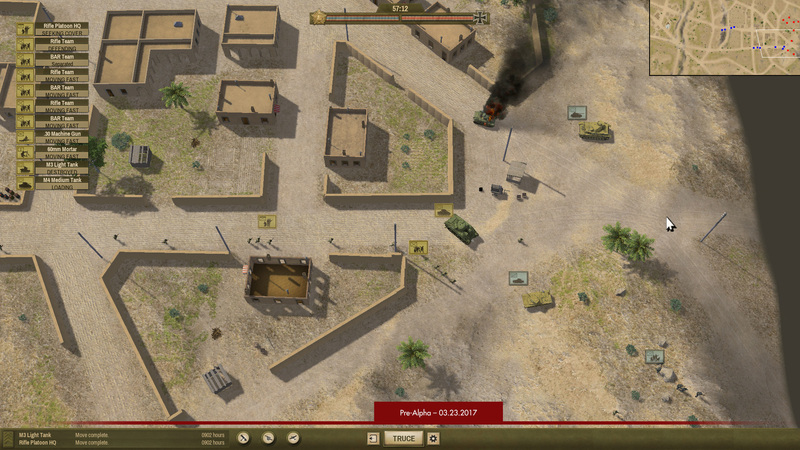 Squad Assault was the second and more successful attempt at putting Close Combat into 3D. GI Combat was the first and did not work very well, Eric Young also worked on that one. It recieved bad reviews and the forums turned into flames and have since dissapeared. From the images I attached you can plainly see the influence of Close Combat into Squad Assault. When I say its literally Close Combat in 3D, thats not an exaggeration, all the same options are there along with copied maps. There are some new options which I will touch briefly on, there are also things taken out like right clicking for map properties. The 3D camera view at first is hard to get used to, however after a couple minutes its simple. Once you find a good camera angle its likely you will stick with it, changing only to check map elevations and LOS. During my St. Mere Eglise battle I did notice troops popping smoke automatically to block incoming LOS, nice touch. Click Read More for screenshots, the demo and more details. In July Wargamer.com and Matrixgames.com announced two new Close Combat titles, Gateway to Caen and The Bloody First. I have consolidated the news and forum posts from both websites and from Steve McClaire to give everyone a summary of what to expect so far. Gateway to Caen will be based off the Panthers in the Fog engine. If you already own PiTF then that gives away most of what you may be asking. 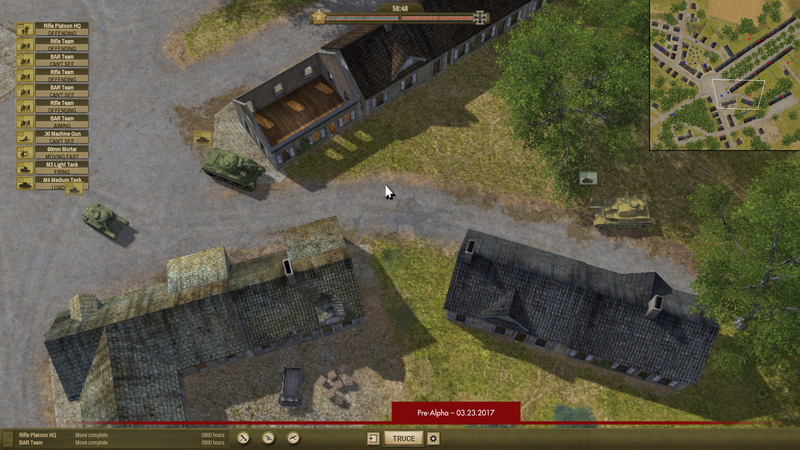 Under the hood Gateway to Caen is just a new campaign built upon PiTF. This will be the last 2D version of Close Combat we will see. The campaign will be based off of Operation Epsom, an Allied campaign intended to flank and liberate the city of Caen between June 26 to the 20th. So we can expect to come up against lots of elite German SS with heavy tanks and lots of automatic weapon fire. For the Allies you can start fantasizing about reloading Bren gun magazines, recocking your PIATs and trying to get your tank destroyers in flanking positions, good luck! I am really thinking about Gold, Juno, Sword now. There may be some major input from the guys that brought you GJS into this version We can also expect a remodeling of some of the games vehicles graphics, and new audio. I hope the `3D` vehicles make a comeback. New maps are a given with any Close Combat, however more effort will be made to make them more detailed and realistic. There will also be possible changes to the team slots. The release date is end of 2013. That brings us to the Bloody First. A brand new 3D version (Unity 3D) of Close Combat, designed in such a way you will still feel like your playing the classic Close Combat, or so they say! The Bloody First is the US 1st Division who fought through Tunisia, Sicily and Normandy. You will be able to play through all three campaigns. Another huge difference will be this campaign mode, it will be more CC3 style than CC5, and it will be down to the platoon level vice company. The campaign may have what Steve McClaire calls, `triggers` and `decision points.` That is to say if you meet certain criteria in a battle, you may be faced with decisions on where to go next, or the game will put you into action again. Along with a new engine there will be new AI, new pathfinding, maps... you name it. A partially destructible environment may be implemented. Think about the game Breach by Atomic in 2009, that was their main selling point. Modability is also being taken into account. The long awaited engine sound feature will finally be implemented, with an on/off switch. Lets hope this feature comes with the added feature of the default setting being off. This will be the 13th version of Close Combat with no multiplayer support beyond 1v1 ---disappointing! Release date, sometime in 2014. We've been discussing both versions since the announcement. If you'd like to join chime in your comments please visit our New Close Combat thread.